Many people are forced to walk alone at night, due to their job or to other chores or duties. Sometimes, they need to cross dimly lit areas and dangerous neighborhoods. These walks can easily turn into a frightening experience, especially when you sense you are being pursued. Women are more prone to becoming the victims of an attack, so they could use some good tips to help them stay safe in such situations. First of all, if there are shops or restaurants along your path home, you should make sure those people know you. Stop and talk to them, ask them to allow you to use their restroom, buy a sandwich, or do anything that would enable them to recognize you later. By becoming one of the familiar faces, these people are going to be happy to allow you to duck inside to avoid some scary guy that might be following you in the dark. 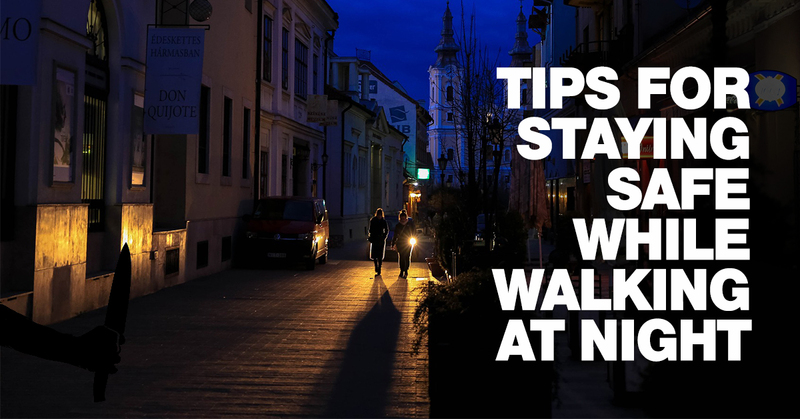 Staying alert is another tip that can help you stay safe while walking at night. Avoid using your smartphone or your iPod, and focus on everything that happens around you. You need to notice your surroundings, so that you can react promptly to any attack or aggression. Besides, if potential thieves don’t see you carrying valuables, they might simply ignore you. A smartphone is a valuable item in the eyes of desperate thieves in search for a few dollars. Try to avoid walking alone in the dark. Most people are happy to have some company in such situations, so try to spot a group heading into the same direction as you, and go together, at least for a while. You don’t have to talk with each other, but sticking together is going to make all of you less nervous. When in trouble, run as fast as you can, and make all the noise you are capable of. You have to call as much attention to yourself as possible, but avoid addressing the potential attacker directly, especially if you aren’t sure he’s actually stalking you. Last but not least, consider wearing a stun gun or another self-defense weapon. These tools can help you stay safe, without having to kill your aggressor. They usually paralyze the attacker for a few minutes. This should buy you the time needed to get out of trouble. Speaking of running fast, women should avoid wearing high heels while walking at night or lose them as soon as they seize a danger. Tips-For-Staying-Safe-While-Walking-At-Night Many people are forced to walk alone at night, due to their job or to other chores or duties. Sometimes, they need to cross dimly lit areas and dangerous neighborhoods. These walks can easily turn into a frightening experience, especially when you sense you are being pursued. Women are more prone to becoming the victims of an attack, so they could use some good tips to help them stay safe in such situations. First of all, if there are shops or restaurants along your path home, you should make sure those people know you. Stop and talk to them, ask them to allow you to use their restroom, buy a sandwich, or do anything that would enable them to recognize you later. By becoming one of the familiar faces, these people are going to be happy to allow you to duck inside to avoid some scary guy that might be following you in the dark. 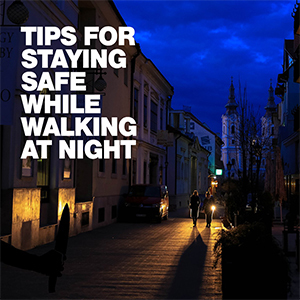 Staying alert is another tip that can help you stay safe while walking at night. Avoid using your smartphone or your iPod, and focus on everything that happens around you. You need to notice your surroundings, so that you can react promptly to any attack or aggression. 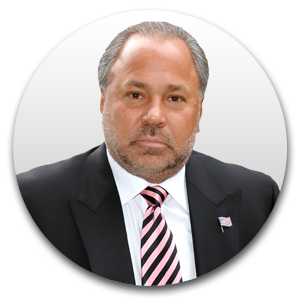 Besides, if potential thieves don't see you carrying valuables, they might simply ignore you. A smartphone is a valuable item in the eyes of desperate thieves in search for a few dollars. Try to avoid walking alone in the dark. Most people are happy to have some company in such situations, so try to spot a group heading into the same direction as you, and go together, at least for a while. You don't have to talk with each other, but sticking together is going to make all of you less nervous. When in trouble, run as fast as you can, and make all the noise you are capable of. 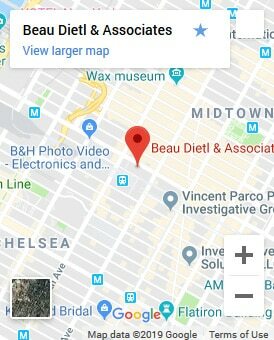 You have to call as much attention to yourself as possible, but avoid addressing the potential attacker directly, especially if you aren't sure he's actually stalking you. Last but not least, consider wearing a stun gun or another self-defense weapon. These tools can help you stay safe, without having to kill your aggressor. They usually paralyze the attacker for a few minutes. This should buy you the time needed to get out of trouble. Speaking of running fast, women should avoid wearing high heels while walking at night or lose them as soon as they seize a danger.